Here’s the Final Prayer of the St. Joseph, Husband of Mary Novena! Amen to your daughter for choosing life! Please pray for my grandson Anthony who has depression and anxiety and has been looking for a job. He is doing better right now but keeps on getting turned down. Also for my husband Mike is overwhelmed it work may they both find peace. I prayed the novena to St. Joseph for my brother’s conversion and saw a major breakthrough in his life on the 9th day of the novena. My brother and I also had the best conversation we’ve had together in over 30 years the following day. I really believe that the Holy Spirit has touched my brother’s heart. Thanks, St. Joseph, for your prayers. I love you! I prayed this novena for my sons and my husband and ask St Joseph to guide and protect them and their family. I ask that they act always with love and wisdom when making decisions in their work and everyday life. Please help them to stay safe and progress in all matters that they undertake and to be good fathers and providers. Bless them and give them health and courage on their journey. Help my husband to find a way to recover all that he lost and maintain a secure financial position in his retirement. Deliver our Son terry from all those who are trying to endanger him either in thoughts and actions. may he find peace and love and a clear path to walk freely. Deliver us from all temptations …..
Join me to plead with Almighty God to heal me of high blood pressure. Thank you St. Joseph for the strength to handle my family and marriage problems. I ask for God’s plan to become clear in our family’s plan. Please restore my marriage to Paul and bring our family back together. Thank you for the health, intelligence, financial security of our family and showing us how to help others. Please guide Paul who did not have a strong father and show him how to lead our family and marriage. St. Joseph. Thank you for interceding on my behalf. I ask that you continue to bless my daughter as she makes a big change in her life. I pray for Julia that we can always be together. I pray for all those making this novena and their intentions. I pray for Joseph c. Who is seeking employment. I prayed this novena for a close friend. She was awaiting test results to confirm a diagnosis of stomach cancer. As I finished the last prayer she called to tell me there was no sign of cancer. Thank you St. Joseph for your intercession in this matter. 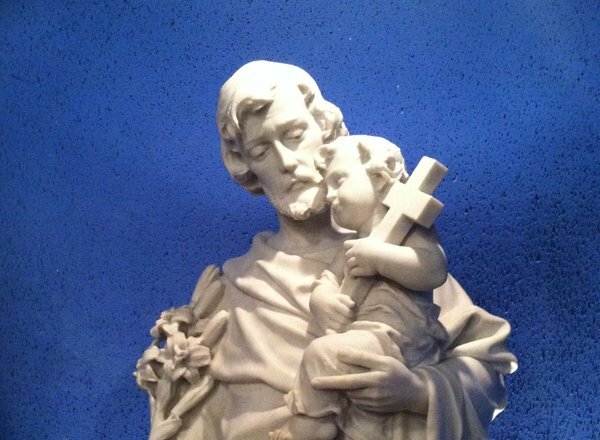 Help me St.Joseph with my troubles. Mary please intercede for me. I love my family and my husband and I wish they can find a place of there own. To many people in one small house is not easy especially when we have 5 blessed grandchildren. We need our home back and they need there’s. It’s been 10 years and I can’t deal with it any longer. Thank you God for all your blessings I’ve received during these hard times. Glory to God! Our Lord hears our prayers. Thank you Lord Jesus, our dear St. Joseph, and all those praying with us. Our daughter’s knee is on its way to full recovery. Glory to God! Amen. I would like to share my testimony I started pray for marriage between me and my patner and today after praying for the last time when we were having lunch he said to me that he is ready to get married to me. I cannot begin to explain the excitement I am feeling, thank you all soo much for the prayers and praise be to God almighty. Please pray for a young lady dying of breast cancer, Rebecca, and my family. Thank you Lord Jesus,all the saints and Angels that help us. We need healings, more love to one another. Thank You God, Holy Family St Joseph for answering our Prayers, our daughter got the job . May our Lord continue to Bless her in this new field of career she is embarking. In Jesus’ Name Amen. I am still asking the same thing.thank you and pray for me God blessed you ????! St Joseph protect us and guide us! Thank St.Joseph. Thk u for being their for the HOLY FAMILY. I thk u for answering my prayers during this novena.Thank u father, son and the Holy spirit. Amen Thank u. Thank you St. Joseph, for your intercessory prayer for my request. God answered my prayer for a good report from an ultrasound with no abnormalities! Amen! Blessed St Joseph thank you for helping me feel better. Help me tomorrow that loneliness can be relieved. In the name of the father. Pleas pray for my husband David. Thank you for these novena prayer i wish i will pass my exam taken last march 12,2017 .athqnk you very muchand hope we can sell more insurane plan this march .Thank you very much .and please guide and protect my family.thank you for the blessings you given to us.thank you very much …..
Lord jesus I place my financial needs into your hands. Lord jesus I pray for financial deliverance. I pray for the intercession of St joseph. I pray for my son who have his exams soon. I pray that he would be successful and score high marks. I pray for money to pay his tuition fees. Thanks for the Novenas, I prayed and hope that this also helped others to know and feel god’s love for them as we go through this period of Lent. Dear sweet St. Joseph. Please be with my husband and heal is back. Help us find good jobs. And a house for all of us to live in. Peacefully. Be with Jenny at this time and let her find a lawyer that can give her what she needs. Be with my children keep them safe. Be with Victor and Erika as them prepare for a child. Please pray for financial assistance. Im so tired of the struggle. In Jesus name I ask. This is the second anniversary of my beautiful daughter’s entrance into heaven, I miss her so much. I am now pregnant and ask for your prayers for the safe arrival of this precious child, that the pregnancy will be free from complications and the child will be born at full term, full of life. Thanking God for all of you and praying that your prayers will be answered in Christ. St.Joseph, pray for us. St. Joseph thank you for all the prayers you have prayed in our behalf. Please St. Joseph may you continue to pray our hearts desire.